When I grew up, side projects was very rare. If you played in a band, you either stuck with that band or you left. Maybe, you could get away with recording a solo album when your band had been playing together for many years. But unless you left your band, you did not tour that solo album. I kinda liked it like that. Today, everybody plays in many different bands at the same time and sometimes it’s a mess to keep track of all the different liaisons from all the musicians’ projects everywhere. On the other hand, it’s quite understandable. When the music business looks like it does, with illegal downloadings and Spotifys, the musicians needs to get an income if they don’t want to take 9 to 5 job and play music on the side. When you’ve earned your living playing music your whole life, working at Starbucks or McYuckals really isn’t an option. Most musicians that have reached middle age also have families – children and very often at least one ex-wife – and mortages and there are bills to pay each month, so they need to get their money from somewhere. Something to think about for all of you who only downloads music from torrent sites or use Spotify and never pays for your music. Ok, enuff of that. The latest “supergroup” to emerge is called KXM, that features lead vocalist / bassist dUg Pinnick (he used to spell it Doug, but I guess he got bored with that) from King’s X, George Lynch from Lynch Mob and Dokken on guitars and Ray Luzier from Korn (ex-David Lee Roth) on drums. I think you can guess for yourselves what KXM stands for. If you can’t, then the K is for Korn, the X is for King’s X and the M is for Lynch Mob. Why George chose the M instead of L is anyone’s guess. How these guys found each other musically isn’t all that clear because all of them comes from different musical backgrounds which means that a project like this can be either a masterpiece or a big confusing mess. What is clear, though, is that all three of them are brilliant musicians who has reached both commercial success as critical acclaim, so on paper, this looked like a really interesting combo. Opening track “Stars” doesn’t feel like the logical opening song. It’s a good tune, but it rocks at a medium pace and it really doesn’t feature any of the trademarks of neither of the members that we’re used to. But things shapes up already by track two, “Rescue Me”. It’s a great melodic hard rocker with a great hook, but still very non-commercial and has a nice groove. In “Never Stop” they have a beautiful and soulful rock ballad that I would release a single / video if I had anything to say about it. Where the songs aren’t reminiscent of any of the guys’ days job, “Faith Is In The Room” takes us to King’s X territory musically, but with a more basic hard rock groove. dUg Pinnick’s voice will, of course, always make you think about King’s X – he has a very unique voice. “I’ll Be OK” is a noisy little number, but still pretty catchy with a groove. “Sleep” is heavy with darkness surrounding it and lyrically it takes up the topic of wife-beating – reality really hits hard with that one. “Love” is great – it’s a potent hard rocker that goes bouncing off a great melody and both the vocals and the music are so very melodic. “Burn” on the other hand, is just a straight forward in-your-face hard rock song, really good and the same can be said about “Human Friction”, a real killer. “Do It Now” takes a more funky turn, but is at the same time a slower hard rocker, but the groove is still very evident. 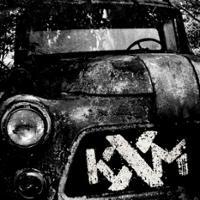 KXM are, I must say, a very cool supergroup and the album doesn’t sound at all like I would have expected. Of course, Pinnick’s voice makes you think about King’s X, but musically the band hasn’t brought their day jobs with them and they have just gone off and written songs just for the sake of writing songs. The stuff here is very rhythmic and even though there are great melodies and catchy stuff, this isn’t music for the charts. I also noticed that the album is a grower so don’t give up after one spin if it doesn’t stick on the spot. If this side project will become the real deal or not, only time will tell, but I can imagine this being a really cool live act, but since Luzier has Korn, that of course is a lucrative business and Lynch both doing Lynch Mob, T&N and soon a unamed project with Michael Sweet (Stryper), James Lomenzo (White Lion, Megadeth, Pride & Glory) and Brian Tichy (S.U.N., Whitesnake, Geoff Tate, Pride & Glory) and Pinnick has King’s X, it really doesn’t feel like this will be their top priority unless this album starts to sell large quantities. Still, I would hope for them to do at least one more album and maybe develop the sound of KXM. This album has its flaws and its fillers, but on the whole, I find this a really good and interesting project. I used to spell my name “Myke” but I stopped doing it…a few people still call me that. There’s an English guitaist, that used to be in a brilliant band named Skin, who spells his name like that. Myke Gray. I remember Skin. They were associated with Bruce Dickinson in the 90’s…worked together on some stuff I think. Well now I know Myke is taken, so I am glad I don’t use it anymore. I also BRIEFLY flirted with Myque but that lasted about a week. They opened up for him on his Skunkworks tour. Blew him the F off stage. Skunkworks wasn’t Dickinson’s proudest moment ever and his band then was anonymous. I thought George maybe picked “M” for Mob. That was my best guess. Yeah I had the same thought…I don’t know! Maybe KXL is a brand name or maybe band name taken by somebody else. That’s all I can think of. Although KXM kinda looks cooler on the front sleeve than KXL !? I’ll pick this up. I won’t expect to be as blown away as I was with Flying Colors and Winery Dogs, but I like two of the three musicians involved a lot. Don’t know a lot about Luzier outside of the one DLR he played on. I know he’s good. Not a bad CD…could use some more Lynch. But the drum work is killer and the bass tones are sphincter rattling. Sometimes stuff just works and IMO, here Lynch and co came up with a monster record, a record that just swings and grooves George managing to move between styles with ease, quite likely one of the most versatile guitarists about today. Lynch dUg and Luzier bring their A-games and the record is a fine fine outting. Only negatives being as lyrically wonderful as they are, the overuse of ballads do cause things to get too slow too often particularly with such a already long record, and remixing/working these tunes for a Euro release after the fact seems pointless and unfair to those like me that already purchased the record only to find some of the reworks are surprisingly an improvement, Lynch supplying some additional solos intros and stuff to an already cool group of songs (prime case in point Burn which comes with a longer better intro and additional solo bah!). But, that aside, this record otherwise shreds and unlike you these ears bleed with Stars thinking it a great album opener, and both Rescue Me and the excellent Gunfight round out 3 of the best right there! Other fave is the already mentioned Burn – that opening heavy to the head bass groove is just perfect! I wonder if there will a second record from these guys now that George have both Lynch Mob back and success with the Sweet & Lynch thing. It sure would be cool to see where this project might take them. I really hope so! Of all the side project from these guys think the best of em all thus far, respectfully think this has a slight edge over Sweet Lynch simply for it sounding so far outta the usual box of Lynch and co!? For arguments sake for example, at its core, Sweet Lynch might have made a decent Lynch Mob record, while KXM was an entirely different beast (at least for Lynch).